This docu-drama presents the story of Claus von Stauffenberg's assassination and coup attempt against Hitler on 20th July 1944 with perhaps greater clarity and psychological insight than any straight factual account could succeed in conveying. Leading reviews from the Danish & German press - "The documentary-fiction of Stig Dalager is deeply fascinating as well as intriguing both as an elementary exciting tale and as a demonstration of the psychological and sociological factors which together influence human lives, and at some point with immense consequences for the world. The portrait of Hitler has an especially deep impact: the psychopath, whose illness makes him blind to the normal ethics of good and evil." Jyllandsposten "Dalager draws a penetrating portrait of Hitler and raises a wonderful memorial for the men who fought in vain against the evil." Der neue Tag Perhaps the Danish writer, Stig Dalager, found the real human being behind the hero's image. 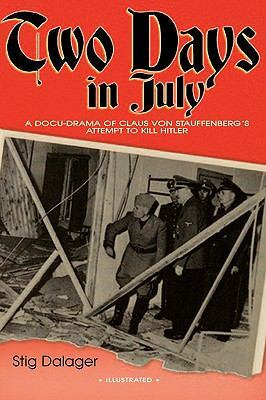 Punctually on the 60th anniversary at the end of June appeared the German translation of the novel Two Days in July. The days around the bomb attack are portrayed in two perspectives: Stauffenberg's and Hitler's. Dalager's Fuhrer is a pitiable almost whimpering figure, looking back to his childhood, and conscious of the prospect of his downfall. Parallel to that, the romantic Stauffenberg in his self-imposed role of hero, experiences delusions of grandeur, fanaticism, and contempt for Adolf Hitler, all going hand-in-hand psychologically in order for him to succeed in his mission. Stauffenberg is obsessed. The picture which emerges of him is less heroic or sympathetic than usually portrayed but because of that is more credible. Matthias Lohre in Das Parliament".